Malibu is a cat covered in flippable sequins. The right half of Malibu’s head has pink sequins that change to silver, and the left half has black sequins that change to gold. Her body is the opposite with the pink/silver sequins on the left and the black/gold sequins on the right. She has large, glittery pink button eyes and a bright pink button nose with a pink embroidered mouth. Her jaw is white, as is her belly. The inside of her ears are sparkly and pink. Malibu was released in June 2018. Her Birthday is on 19th February. 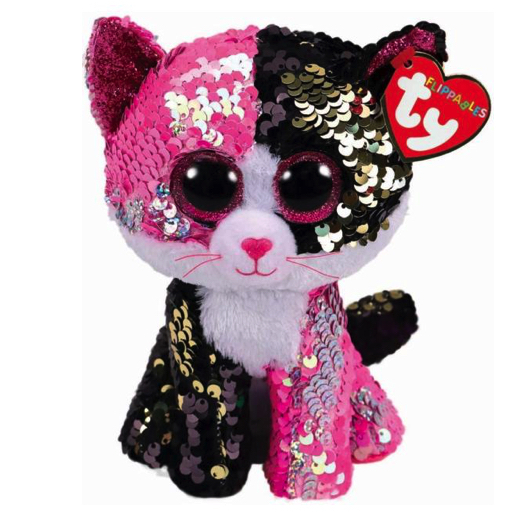 She is part of the Ty Flippables range with reversible sequins that change colour when you run your hands over them. This is the medium 9″ version of Malibu. She was also released as a small 6″ Flippable.